It’s been a summer filled with travel, visits from dear friends, a new job, and quality time with the BF. 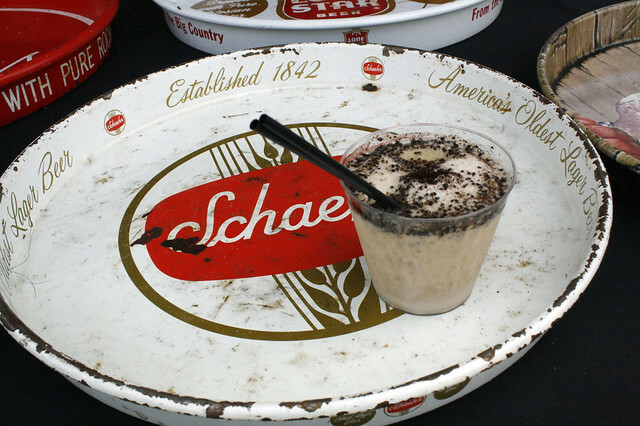 I hadn’t had much time to check out events around the city and found myself daydreaming of summers of years past, where my weekends were filled with beer festivals and food tastings. My college friend, Ali, recently moved to the area and launched her own website, RateTheBiz, which helps people in the hospitality industry get the inside scoop on what it’s like to work at bars and restaurants in their area. She’d gotten wind of Taste Williamsburg Greenpoint and wanted to check it out to get a better feel for all the restos in her new hood. 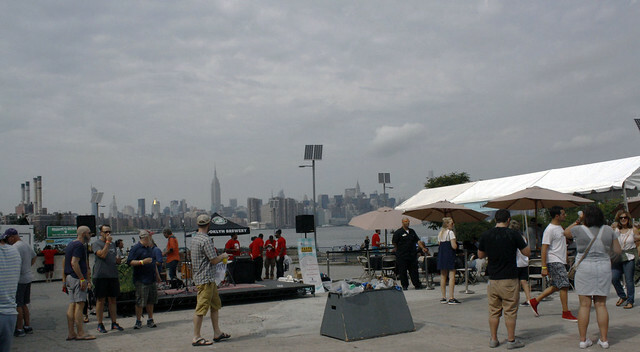 I considered it perfect timing, as I was craving a food festival (no pun intended), especially when it’s block-party style and right next to the East River on a gorgeous day, and decided to tag along. We had a handful of food and beverage tickets between us and decided to make a few laps around the festival and share as many items as we could. With over 50 Brooklyn establishments in attendance, like Lilia, Meatball Shop, Maison Premiere, and Le Barricou, it was hard to choose where to start. But our first bite of the day ended up being one of my favorites. 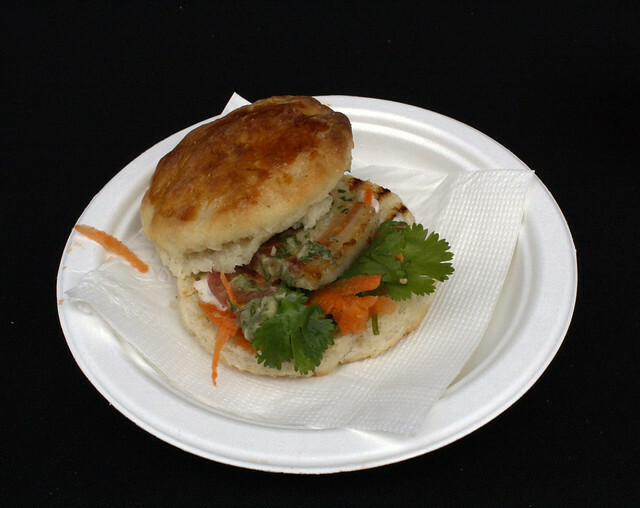 Anella was serving mini pork belly biscuits, topped with shaved carrots, cilantro, pickled red onions, and a spicy remoulade. 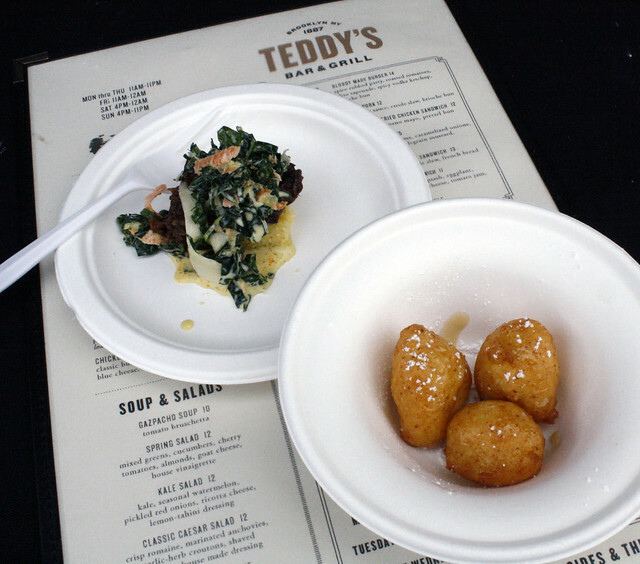 The biscuit tasted like a cheddar biscuit and was so flavorful and flaky, while the pork belly was smoky and savory. The cilantro gave the dish a bit of an Asian twist. I easily could have eaten ten more of these. 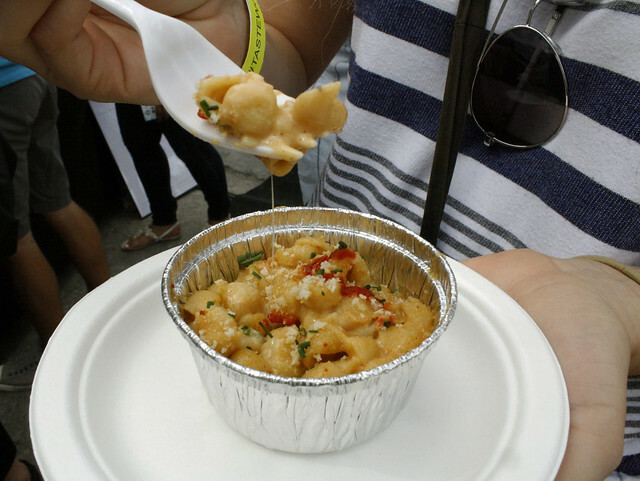 Freehold had another one of our favorite tastes of the day – crawfish mac & cheese. This dish transported me to the streets of New Orleans. 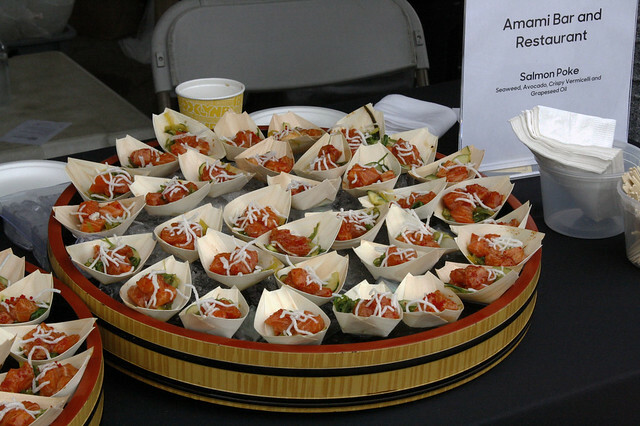 The Creole flavor and spice was prominent, but didn’t overpower the savory cheese. 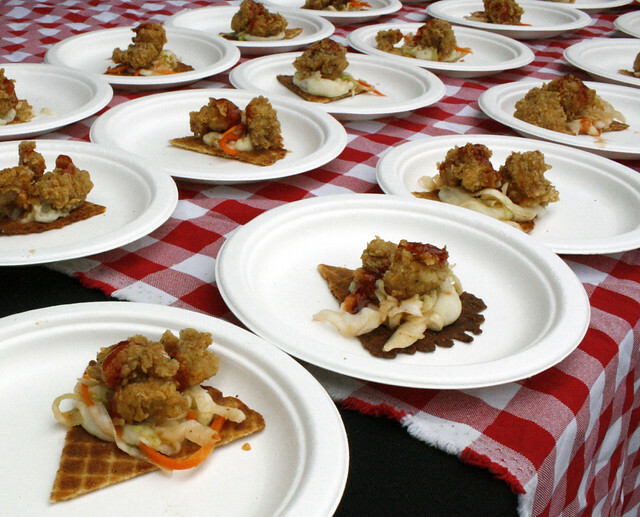 One of the more interesting dishes we came across was the fried chicken and black pepper waffle from The Brooklyn Star. Rather than serving a mini waffle, they served the chicken on top of what was essentially a waffle chip. Mashed potatoes, slaw, and Sriracha honey were also incorporated into the dish. The waffle chip, mashed potatoes, and spicy honey brought a unique twist to this classic brunch dish. Certain elements evoked Southern flavors, while the spice and slaw were reminiscent of Asian cuisine. I hope The Brooklyn Star considers putting a larger version of this on their regular brunch menu, if they don’t have it already! Bedford Cheese Shop had the most exciting setup of the day. They were serving hot, melted cheese fresh off the wheel. We stood and watched the fromager gently scrape a few large dollops of cheese, then realized our mouths were watering and we had to try some for ourselves. 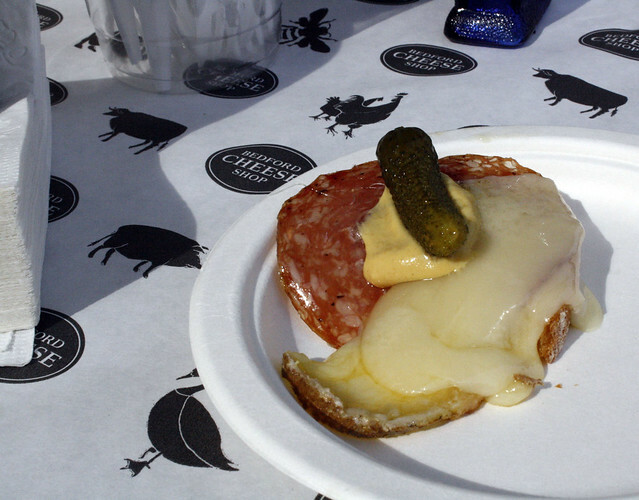 They served it on a baguette with a slice of charcuterie, mustard, and a mini pickle. It was an incredibly simple dish that made me wish I was back in Paris, eating cheese in a local café and sipping on a glass of red wine. There were various breweries, wineries, and local bars at the event serving up some signature cocktails and other boozy beverages. When we passed the Skinny Dennis tent, a Williamsburg haunt that I’ve found myself at on many a Saturday night, I had to check and see if they had their infamous Willie’s Famous Coffee. They did! While I told myself I was only going to try things I hadn’t tried before, I couldn’t pass up their boozy coffee slushie. It’s honestly one of the most delicious boozy beverages I’ve ever tasted. 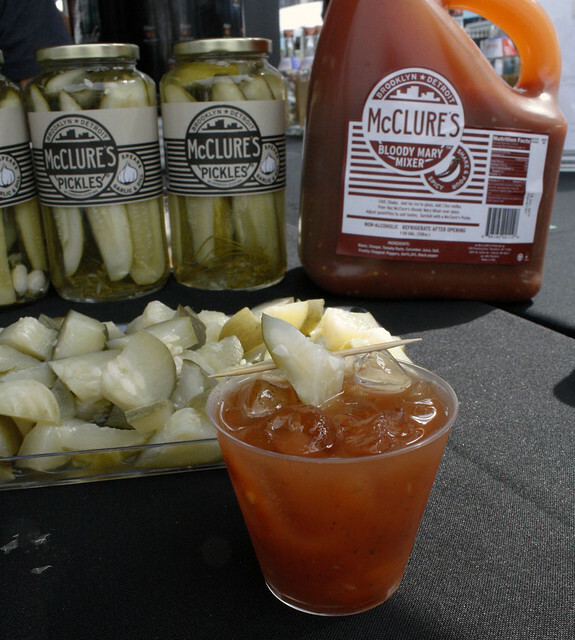 After one more lap and a few (ok, a lot) more food samples, we stumbled upon the McClure’s Pickles tent. I’ve seen their Bloody Mary mix in stores countless times and always contemplated buying it, but never did. I can guarantee you I will now. Topped with a spicy pickle, this Bloody Mary was possibly the best one I’ve ever had. Made with spicy pickle brine, tomato paste, fresh cucumber juice, and a few other ingredients, this cocktail was so incredibly fresh and flavorful. I even went back for seconds…and thirds. 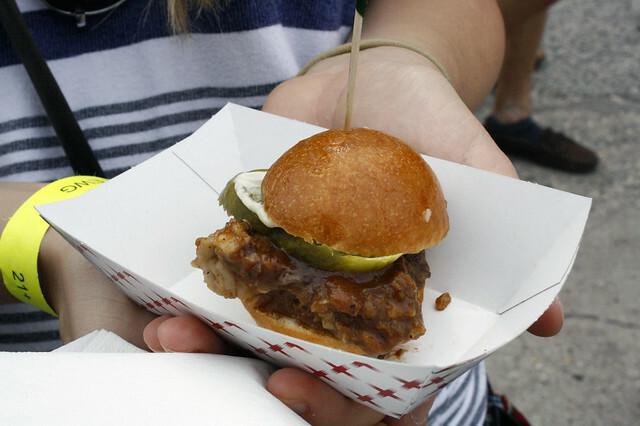 All in all, Taste Williamsburg Greenpoint was a very organized event with a solid celebration of the food and beverages Brooklyn has to offer. I definitely plan on checking it out again next year. 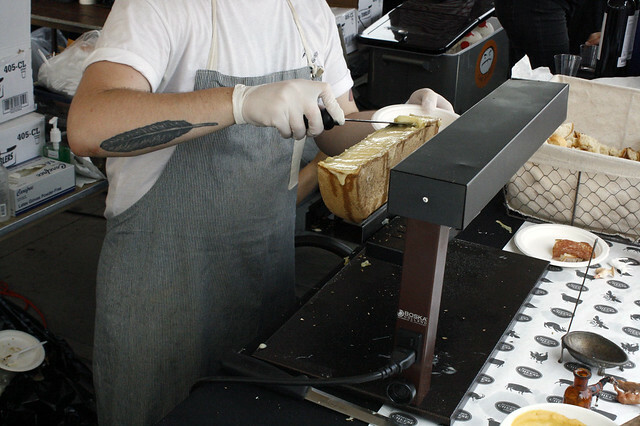 To learn more about Taste Williamsburg Greenpoint, click here.